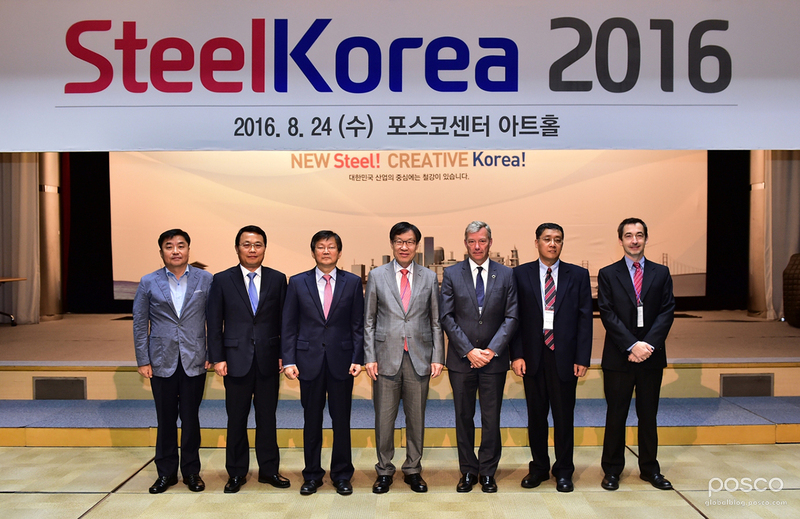 On August 24, Steel Korea 2016 was held at the POSCO Center, organized by the Korea Iron & Steel Association and the Korean Institute of Metals and Materials. Steel Korea 2016 provides the steel industry and relevant academic and research institutes with the setting to evaluate the current situation of the Korean steel industry. Steel in Korea is having to face a rapidly changing global environment, and must explore ways to enable the continuous growth of the industry by making new breakthroughs. It was the second annual meeting of the event, attended by 300 people, including Chairman Ohjoon Kwon, Vice-Chairman of Hyundai Steel Yoocheol Woo, Chairman of the Korean Institute of Metals and Materials Jongsoo Lee, and Chairman of the Korea Steel Scrap Industry Association Youngdong Park. Kwon said that the industry should make bold investments into new technologies and products in order to supply better quality products at lower prices, and companies should secure a solid management foundation through strong corporate restructuring that would remain unaffected in any occasion. On August 24, the Korea Iron & Steel Association held Steel Korea 2016 at the POSCO Center to seek a breakthrough for the steel industry. Chairman Ohjoon Kwon emphasized that, in order to overcome the crisis in the steel industry, the industry, academia, research institutes and the government should come together to improve responsiveness. The participants agreed that strong domestic demand is instrumental to the continuous growth of the steel industry, and pledged to build up a strong partnership with relevant industries, such as automotive and construction, as well as to block imports and distribution of unfairly traded products. The event also included a wide range of presentations concerning the future of steel and construction, including the flow of demand for structural steel in each industry; current status of product development; current status and future prospects of steel using technologies in different industries, such as automotive, shipbuilding, home appliances and stainless steel; seismic design in steel structures; trends of Iran’s construction market; and future steel housing.